I'd been putting off making a cold frame on the assumption that it would only be in the way. But with the shed in the garden, there's a nice long length of wall where I can put my frame. So a bit ago, on an afternoon when it couldn't decide whether to rain or not, I got out the garden fork and spent an afternoon loosening the sod. 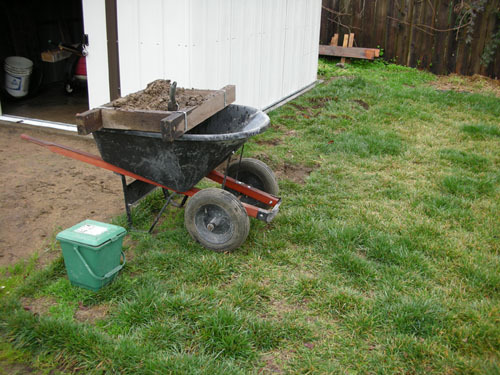 It's basically gravel under the sod at that end of the yard, so the forking was hard work. The idea is that I want to dig out the native soil to about 8-10 inches, then replace it with a mix of compost and soil. Then I regularly dig out some of the soil and replace it with mixed soil and compost. There are a lot of theories on cold frames, but this is the method I prefer. Getting the sod out of there was harder. For one thing, it kept raining on me, and for another, the soil was -- and mind you I'm not complaining here -- just stuffed with worms. So I didn't want to run them through the sifter, and I ended up hand-picking the dirt out of the sod. I did make a little pile of gravelly soil in the sifter, but sifting wet sand is really not a fun way to spend your time. So it's waiting for me to get back around to it. I know this is a lot of images for very little actual work, but there's something about how green the lawn is at this time of the year that makes me a little silly. The cold frame will mostly be used for hardening off seedlings and growing lettuce year-round. In between gently removing worms from sod, I spent a little time extending the brick edging by the strawberries. We found a bunch more bricks when we did the rose move last month, and in the interest of not throwing more bricks away I used them as edging. I'm hoping this keeps the dogs from using that planting bed as a racetrack, but I'm not holding my breath. The digging part of the cold frame is going to be a lot of work, but I think I will wait until I can work on it for a whole afternoon without having to dodge the rain. when you put the brick in as edging did you dig a trench to anchor them in. My first year in my house i used bricks but didnt dig a trench to anchor them down and it needed a lot of up keep. To be honest I would rather be gardening, then fixing the bricks. Yes, the bricks are sunk about halfway. I'm really just sort of coming up with excuses to use up bricks at this point, because we have so many of them.